The goal of this project is to develop novel concepts for treatment with particle therapy as well as in vivo verification of skull base tumors with special focus on low- and high grade meningiomas. The optimization of existing treatment options will be first of all investigated by means of treatment plan comparisons of the already applied proton and carbon ion beams with potentially benficial helium beams. Special emphasis will be given to the possibility of reducing toxicities and radiation induced risks, which could in turn be connected to dose escalation studies. These comparisons will not only involve absorbed and biological RBE-weighted dose as provided by available TPSs, but will also include detailed comparison of relevant quantities such as dose-averaged LET and neutron dose which may be provided by dedicated Monte Carlo simulations. Moreover, the clinical feasibility of high dose conformality with reduced burden to surrounding critical structures will be addressed via prospective application of post-irradiation PET-based treatment verification within the framework of the MIRANDA IRB-approved clinical study. Patient undergoing a PET/CT measurement after scanned ion irradiation at HIT. Multifocal diffusely spreading atypical meningioma in a 55-year-old woman. 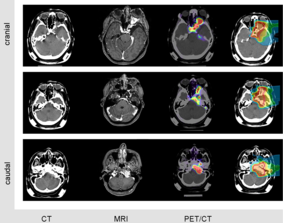 Nischwitz SP, Bauer J, Welzel T, Rief H, Jäkel O, Haberer T, Frey K, Debus J, Parodi K, Combs SE, Rieken S. Clinical implementation and range evaluation of in vivo PET dosimetry for particle irradiation in patients with primary glioma. Radiother Oncol. 2015 May;115(2):179-85. Combs SE, Welzel T, Habermehl D, Rieken S, Dittmar JO, Kessel K, Jäkel O, Haberkorn U, Debus J. 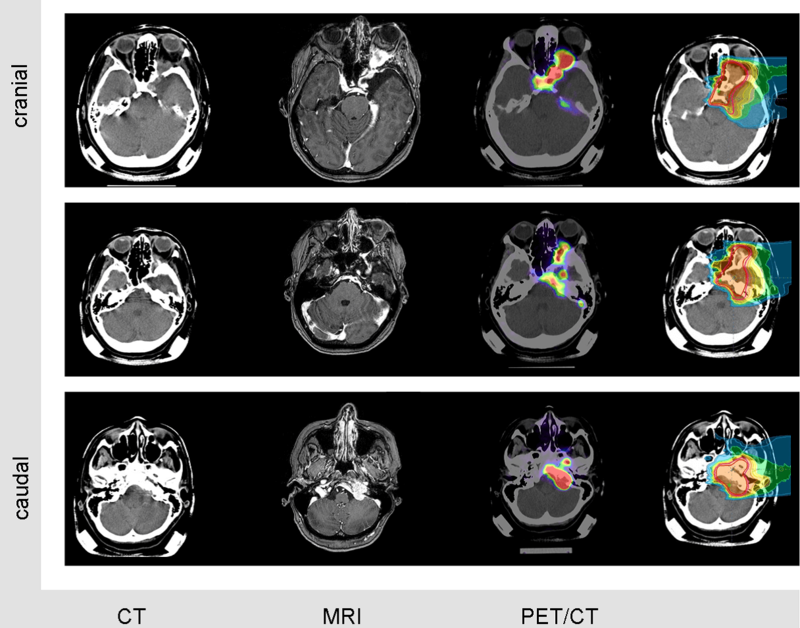 Prospective evaluation of early treatment outcome in patients with meningiomas treated with particle therapy based on target volume definition with MRI and 68Ga-DOTATOC-PET. Acta Oncol. 2013 Apr; 52(3):514-20. 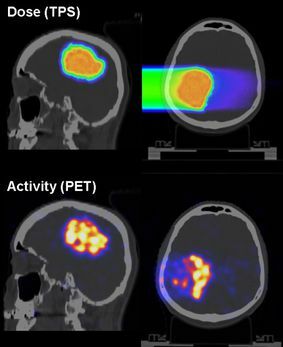 Combs SE, Bauer J, Unholtz D, Kurz C, Welzel T, Habermehl D, Haberer T, Debus J, Parodi K. Monitoring of patients treated with particle therapy using positron-emission-tomography (PET): the MIRANDA study. BMC Cancer. 2012 Apr 3;12:133. Rieken S, Habermehl D, Nikoghosyan A, Jensen A, Haberer T, Jäkel O, Münter MW, Welzel T, Debus J and Combs SE. Assessment of early toxicity and response in patients treated with proton and carbon ion therapy at the Heidelberg Ion Therapy Center (HIT) using the rasterscanning technique. Int J Radiat Oncol Biol Phys. 2011 Dec 1;81(5):793-801. Combs SE, Ellerbrock M, Haberer T, Habermehl D, Hoess A, Jäkel O, Jensen A, Klemm S, Münter M, Naumann J, Nikoghosyan A, Oertel S, Parodi K, Rieken S, Debus J. Heidelberg Ion Therapy Center (HIT): Initial Clinical Experience in the first 80 patients. Acta Oncol 2010 Oct 49(7):1132-40. Combs SE, Kieser M, Rieken S, Habermehl D, Jäkel O, Haberer T, Nikoghosyan A, Haselmann R, Unterberg A, Wick W, Debus J. Randomized phase II study evaluating a carbon ion boost applied after combined radiochemotherapy with temozolomide versus a proton boost after radiochemotherapy with temozolomide in patients with primary glioblastoma: the CLEOPATRA trial. BMC Cancer 2010 Sep 6;10:478. Parodi K, Paganetti H, Shih H, et al. Patient study on in-vivo verification of beam delivery and range using PET/CT imaging after proton therapy. Int J. Radiat. Oncol. Biol. Phys.2007;68:920-934.